The collection of David Gainsborough Roberts – one of the world’s largest Marilyn archives, including many of her iconic movie costumes – will be sold in November, Julien’s Auctions has announced. Although the live auction will be held in Los Angeles, UK fans will be able to see Roberts’ full collection at London’s Design Centre from May 25- June 20. It will then visit the Newbridge Museum of Style Icons in Ireland from June 25-July 25, before crossing the Atlantic on Cunard’s Queen Mary 2 in August, with more US exhibition dates to be confirmed. Fellow collector Scott Fortner has been helping to catalogue the items, and is reporting his findings on the MM Collection blog. And finally, here’s an excerpt from the Julien’s press release. 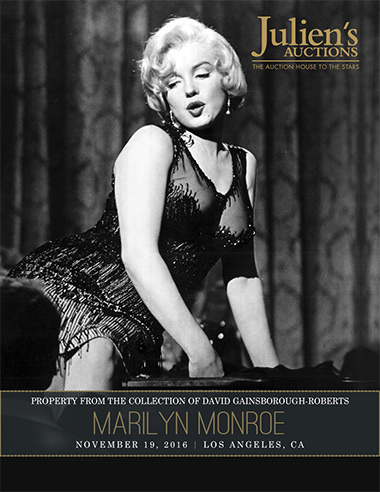 “Highlights from this historic sale include a sheer black beaded and sequined dress worn by Monroe in her Golden Globe winning role Sugar Kane as she crooned ‘I’m Through With Love’ in the award winning 1959 film Some Like it Hot; an elaborate embellished stage gown worn by Monroe as she sang ‘After You Get What You Want You Don’t Want It’ in the 1954 comedy There’s No Business Like Show Business which was designed by one of Marilyn’s all-time favorite designers, William Travilla; a pink linen halter wiggle dress designed for Monroe by Dorothy Jenkins for the 1953 thriller Niagara; a green satin one-piece with black sequins and gold fringe worn by Monroe as she sang ‘That Old Black Magic’ in the 1956 film Bus Stop; a lilac satin leotard worn by Monroe as Lillian Russell in the 1958 photo series by Richard Avedon and featured in Life magazine in 1958. Additional film pieces offered include costumes from Gentlemen Prefer Blondes and Let’s Make Love, along with a pair of rhinestone earrings worn by Monroe in How To Marry A Millionaire and a pair of sequin embellished opera gloves from the Rachmaninoff scene of The Seven Year Itch.